La Marina Village Costa Blanca offers up to date rooms and apartments, It is also a wonderful place to observe the natural world. There is a wealth of plants and animals (some of them rare) in the region of the sand dunes. The Beaches offer clear waters, fine golden sand, areas of high ecological value, such as coastal dune ecosystems. 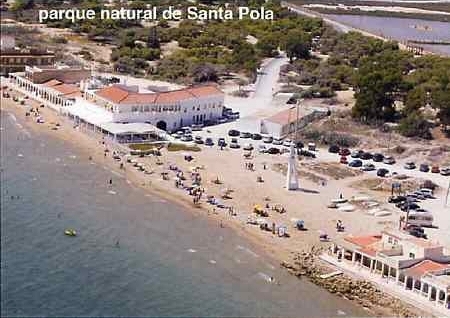 The beaches where dunes merge with the pine trees in a beautiful and very typical Mediterranean landscape, with palm trees, eucalyptus and a large mountain in the distance, the Sierra del Molar. Its climate, typically Mediterranean, with mild winters and moderately warm summers, invites long walks along the beaches or for those who wish to enjoy nature hiking in the Sierra del Molar. Staying in La Marina will offer something for everyone - this is a great place to sunbath and swim or indulge yourself in something more active such as scuba diving or sailing. The village can also serve as a convenient base from which to explore the surrounding areas. 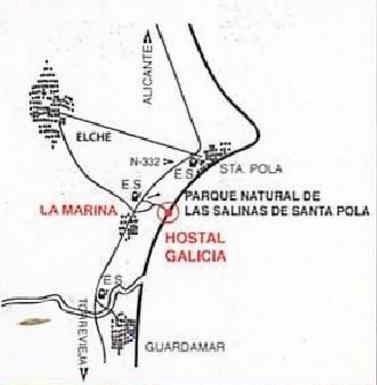 At one end of the beach you will find the restaurant at Hostel Galicia it is well known locally for its excellent Paellas. But having eaten there I must mention the Chicken dish - it was really one of the best I have ever had - apparently it is a Galician recipe. 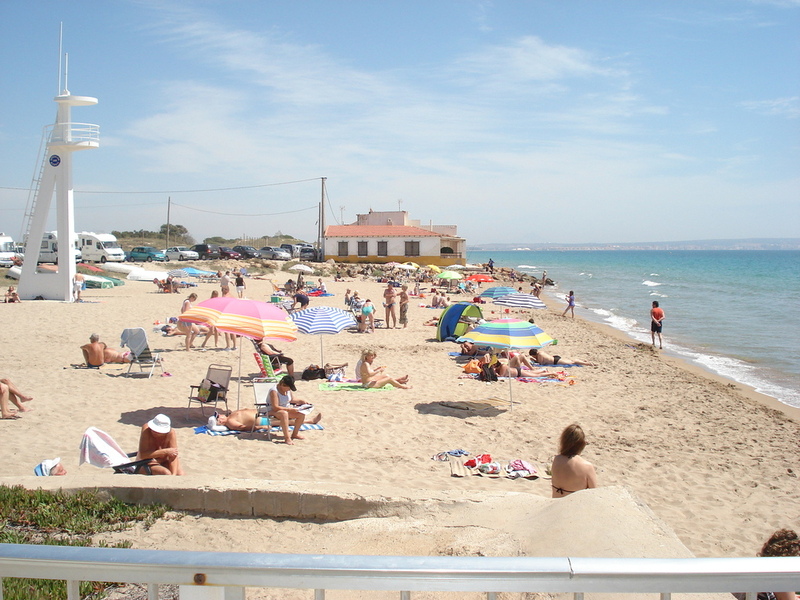 A stones throw from the cities ALICANTE and ELCHE and within walking distance of the beach. Just 500 meters from our La Marina Hotel you will come to a stunning and extensive golden sandy stretch of crystalline waters and legendary dunes and pine forest. COME AND ENJOY US ! The 30 Hotels in Alicante Click above for Discounted prices of Hotels on the Costa del Sol. Save up to 75% on your reservation! Just on the edge of La Marina Village is a Newly built shopping centre (Comercial Bahia) with Supermercados (Lidl, Mercadona, Oversea Iceland) and restaurants and other shops (on the main street of La Marina / Guardamar). This is the nearest of the shoping centres to the beach area other than those in the Village.